Another busy week, while Georgia and I were out of town, the remaining work core converted the museum from summer to fall. The weather changed too so we came home to fall weather and fall decorations in the exhibit area. NICE! 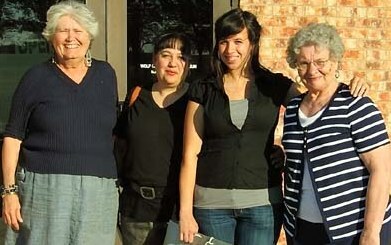 The conference in Oklahoma City was refreshing and educational for us. The American Association for State and Local History is a membership of museum and historical institution professionals and volunteers. The programs were varied and well planned. We visited with our HELP mentors, Edana and Brain it was wonderful seeing them and bringing them up to date on our museum's progress. They are now in six states with over 110 museums. To think that we were in the first group that Launched the program is a tribute to Mildred's and Dorothy's wisdom that has allowed us to continue our growth. We heard many speakers with new ideas on how to digitalize our maps ( I got new software on maps archiving), care for our documents (Georgia learned how to build a box) and many other topics on Historical recording to the politics of history institutions. By Saturday, Georgia and I were exhausted from the 6 am to 9 pm schedule and brain weary from all the new and up dated information. Meeting with people from other states also reaffirmed that Texas has a great program in the Texas Historical Commission. A great meeting. Instead of Historical musings this week. I am including the following written by Lovella Theissen on the exhibit "DORD...remembered" and the reception. "We felt the "DORD...remembered" show was a success. Our only advertisement about it came from our weekly new column or by word of mouth. Paintings were brought in by a number of Dord's former students from Guymon, Hardesty, Shattuck & places in between. Dord's sister Elma Lue Case loaned several portraits that Dord painted of their family members Dord's nephew, Norvie Fitz, Shattuck loaned 4 more so we were very pleased at the response. Graziella Marchicelli, Director of Amarillo Museum of Art, graced us with her presence and brought the 90 minute documentary produced by the museum entitled DORD. Elma Lue Case had her hands full that day with the farm sale and that she & Clarence would be moving to Woodward later that evening. She was able to see the documentary and it was special watching her view it. It brought back special memories of a brother who was very dear to her. We were limited in space and know many more would have loved to see it and some visitors were not able to view the printing and we apologize for that. The paintings will continue to be exhibited through the month of October. Please come see them.